Gujarat State Education Board is the board for primary and upper primary education in the government of Gujarat. Every year it releases notification for the recruitment of teachers in those schools. 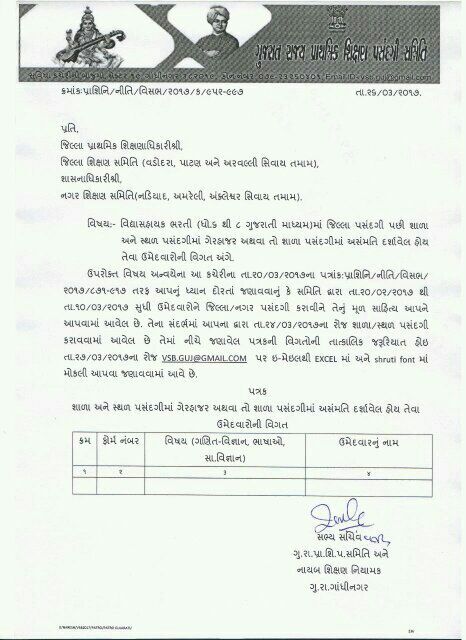 Now, it invites applications fo 1000 vacancies from HTAT qualified candidates for the post of Head teacher. GSEB Vidhysahayak Bharti 2017 For Apply Online Vidhysahayak 6000 (Maths-Science / Language & Social Science) & HTAT Posts @ www.vidyasahayakgujarat.org : Gujarat State Government Invites Online Application For The Recruitment of Vidyasahayak (Teacher) & HTAT 2017.